Dial is matte black with Arabic numerals and highly luminous markers and hands. Leather strap. Verified Owner Comments: Even better looking on the wrist. The detail in the finishing is amazing. I tried on the Breitling Navitimer World and at 46mm it's a monster. The Sinn 903 is perfect in form and function. 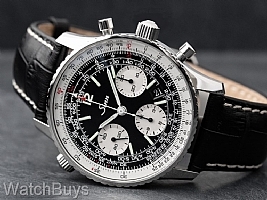 I prefer the Sinn styling to the Breitling. Simply and amazing piece, thrilled to own it! "Wonderful Watch and Excellent Service"
Verified Owner Comments: This was my first purchase from Watchbuys and the process couldn't have been better. Communication was excellent, and shipping/delivery was prompt. As far as the watch, I am very satisfied with the purchase. The fit an finish of the case is exactly what you would expect from Sinn. Quality is impeccable. In-person, the dial on this watch is beautiful. The strap is a little stiff, but seems to be well-made. Would highly recommend. Thanks! Verified Owner Comments: Um, this watch is insane! I knew I wouldn't be sending this back even before the protective wrap was removed. Absolutely stunning timepiece. The WatchBuys people are great too!